If you own a townhouse in Harlem you’ll be happy to hear that the market has hit bottom and is now starting to go back up. A few months ago I pulled a list of Harlem townhouses that had sold over $1M and the list was pretty short (only 5), the highest price was just under $1.7M and the price per square foot was pretty miserable. PRIME locations like Strivers’ Row were getting in the mid-$300s/sq. ft. and ones that needed significant TLC on decent blocks (like Hamilton Terrace) were selling for just under $300/sq. ft.
Well, if you bought at those prices I think you bought at the bottom of the market. Things are much better now. The number of sales over $1M has doubled to 10 for the past 6 months and at least one of the properties is back over $500/sq. ft.
14 W 120 St (Mt. Morris) – $1.385M, $3,37 sq. ft., $456/sq. ft. – 18′ 4 story brick townhouse literally across the street from Marcus Garvey Park. SRO restricted. HPD says it has one class A apartment and 9 class B rooms. For some reason DOB has it classified as 4 family, but is aware it’s SRO restricted. 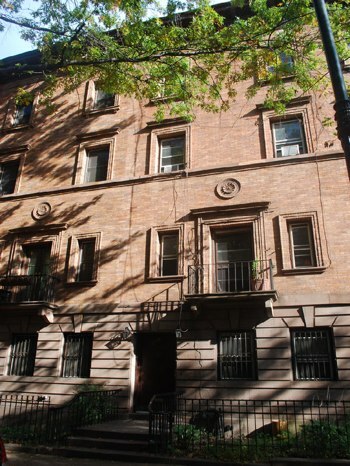 116 W 120 St – $1.485M, 3,636 sq. ft., $408/sq. ft. – 20′ 4 story painted limestone townhouse. Surprisingly this is an SRO restricted old law tenement. HPD says there is one class A apartment and 6 class be “rooms”. DOB still classifies it as an old law tenement, but doesn’t realize it’s SRO restricted. 7 W 119 St (just outside the Mt. Morris Historic District) – $1.098M, 2,794 sq. ft., $393/sq. ft. – This was a shell and was recently gut renovated with an uneven mix of high end and low end finishes. We went through it. The building is one of the smallest townhouses you’ll see – 14′ x 47′. The rooms in it are TINY and the “back yard” is just a small deck. Our couch wouldn’t come close to fitting in the living room. It’s a technically a 2 family since there’s a VERY small studio apartment in the front half of the ground floor. I have no clue how they’ll rent such a small space. It should have been made into a single family. In my opinion the buyer over paid, but that’s a good sign as far as the market goes. 106 W 118 St – $1.275M, 3,400 sq. ft., $375/sq. ft. – 17′ x 49′ 4 story brownstone. It’s a legal 3 family, that was converted about 10 years ago. 15 W 122 St (Mt. Morris) – $1.375, 4,180 sq. ft., $328/sq. ft. – 18′ x 53′ 4 story brownstone. This is technically an SRO. HPD shows it having one class A apartment and 8 class B rooms. However, DOB shows it has being an SRO-restricted 2 family. 590 W 152 St – $1.2M, 3,744 sq. ft., $320/sq. ft. – 16′ x 52′ 4 story limestone townhouse with a C1 commercial overlay on it’s zoning. Like the last one, HPD shows it having one class A apartment and 8 class B rooms. However, DOB shows it has being an SRO-restricted 2 family. 76 Edgecombe Ave – $1.436M, 4,611 sq. ft., $311/sq. ft. – This is a lovely 19′ brick townhouse on a corner lot. There would be incredible light in the building since the long wall faces south (too much for my tastes, but I know others like southern exposures). It’s a completely legal 4 family with no SRO restrictions. 226 Lenox Ave (Mt. Morris) – $1.25M, 4,932 sq. ft., $253/sq. ft. – A very grand 20′ brick townhouse that was a former funeral parlor. Curiously this is technically a rooming house with no apparent SRO restrictions – somehow with the funeral parlor in there they avoided SRO status. In addition to the funeral parlor there are 2 class A apartments. 146 W 136 St – $1.1M, 4,590 sq. ft., $239/sq. ft. – 17′ x 56′ 4 story townhouse. It shows as 3 family, but DOB is still showing it as SRO-restricted (probably an error). The new C of O was just issued a year ago, so this is newly renovated. This was an incredible deal. The weird part is I can’t find any record of it having been for sale, so there has to be more to this than you can see at first glance. So there you have it – the top sales for the past 6 months for Harlem townhouses. Considering that just about every week a townhouse will sell in Brooklyn for over $2M, that’s sorta a sad lot by comparison, but at least things are better than they were a few months ago. It’s also interesting to note that none of the sales were in Hamilton Heights / Sugar Hill. 6 of the 10 were south of 125th in and around the Mt. Morris Historic District. Given that our place is in the same area the good news is that we’ll have no problem with the future value appraisal for our rehab loan. It would seem our place will be worth about $400/sq. ft. when it’s completed. That brings up another point… The sum total of all of these numbers is that when the top end of the market goes up, everyone goes up. Let’s take our case. When we were bidding I was thinking our place would be worth maybe $325-350/sq. ft. when it was done. So if we put $150-200/sq. ft. into it I had to subtract that from the finished value for things to make sense. We bought at $122/sq. ft. so we’d be safe no matter how you looked at it (provided the market didn’t continue to go down). Now that the top number is $400/sq. ft. things are significantly better. I still think the biggest risk are the ones in the middle that need more work than you might think. It’s still easy to over pay for those properties. The best bets are shells and ones that are recently renovated. 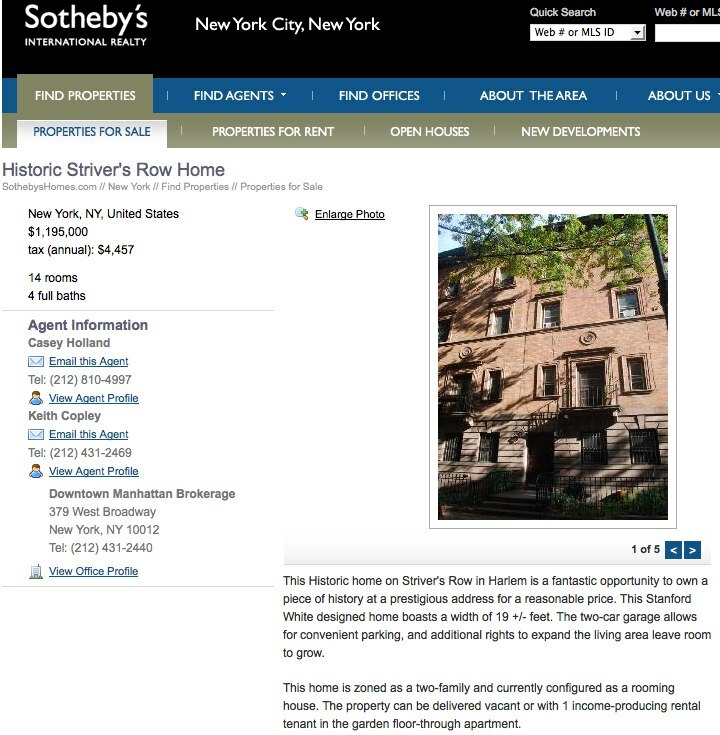 Unless there’s more economic turbulence, I’m firmly convinced now is the time to buy a Harlem townhouse. The trick is finding one in a decent area, without SRO issues, where they’ll sell low. If you know anything about townhouses in New York that statement looks very suspicious… A two-family “currently configured as a rooming house”? Rooming houses are never “zoned” two family. And zoning has nothing to do with the number of families anyway – zoning has to do with the height, bulk and general use of the building. So what exactly is 259 West 139th? Let’s start with what the NYC Department of Buildings says… The DOB’s property profile for the building says it is “SRO Restricted”. If you follow the link on that page to see the certificate of occupancy for the building you see there is a C of O for the garage that was issued in January 1950, but no C of O for the main building (which is typical of older townhouses). There is one other C of O linked to that property, but it’s an error – a temporary C of O for a completely different building. The key thing to notice there is 0 “A Units”, 14 “B Units”. “A Units” are normal apartments, “B Units” are rooming house rooms. So 259 West 139th Street has no legal apartments and instead has 14 rooming house units. That means Sothebys is suggesting a illegal use of the space – you can’t rent an apartment that isn’t registered in some way with the City and DOB and HPD are the two ways to make an apartment legal. So both DOB and HPD say the place is an SRO, ergo it’s an SRO. When you head over to the Department of Finance you see a different story. There you see it’s building class C3 which stands for a 5-6 family home. Now, it’s typical for Department of Finance to get it wrong and in this particular situation it doesn’t make much of a difference since 5-6 family homes and SROs pay the same amount in taxes. But the point is if it were a 2 family home the owner would have it classified correctly with DOF since 4+ family homes pay 7 times the property tax as 1-3 family homes. That’s not an error you’d let slide for very long. I am SO tired of real estate agents giving false and inaccurate information on their listings. It’s really not that hard to find out the truth. But it’s common for real estate agents to answer the question “Is there a certificate of no harassment in place?” with “the building can be delivered vacant”. If you’re outside New York you’ll be excused for not knowing the absurdity of that answer but in the 1980s New York City went through a real estate boom and low income people were being evicted from their apartments and becoming homeless. Rooming houses are where the poorest people in New York live. If you lose your place at a rooming house there just aren’t any cheaper options and you wind up homeless. So in 1985 a moratorium was placed on conversions of rooming houses (SROs). A year or two later that was reworked so landlords who wanted to do an SRO conversion were required to get a “certificate of no harassment” where the City verified that the landlord didn’t force out or intimidate any tenants in the prior 3 years. You could also be turned down if there was an open violation for an illegal conversion. Certificates of no harassment are vital for anyone buying an SRO and wanting to use it for something other than an SRO. It really doesn’t matter if it’s vacant and any licensed broker selling a townhouse should know that. And lying and saying it has a C of O that it clearly doesn’t have is completely inexcusable. Thank god Property Shark and the City of New York put all the info online and make it easy to tell brokers they’re lying. It’s amazing how quickly their story changes when you say you’ve looked up the property up on Property Shark. Still, it’s a huge hassle that is completely avoidable. I feel sorry for the poor buyers who don’t understand how to find the information and learn the truth. If you don’t do your due diligence and you have a crappy lawyer who doesn’t do it either, it can devastate you financially.